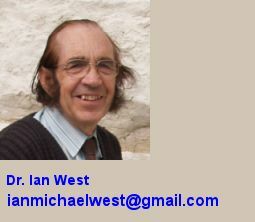 West, Ian M. 2013. The Purbeck Formation of Southern England; Sedimentology of Evaporites: Geology of the Wessex Coast. Internet field guide. 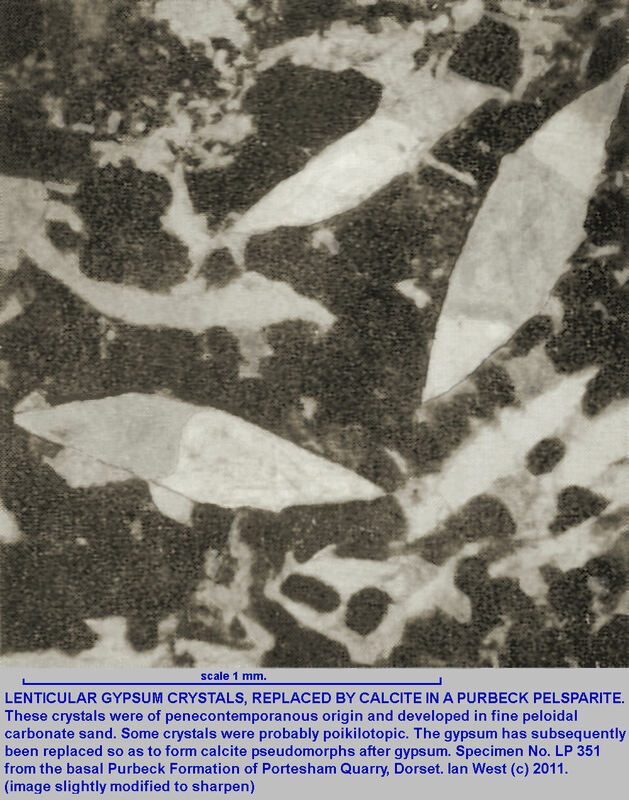 http://www.southampton.ac.uk/~imw/Purbeck-evaporites.htm. Version: 19th December 2013. | Geological Bibliography for Lulworth Cove |Stair Hole, Lulworth |Purbeck Palaeoenvironments | |Fossil Forest - Stratigraphy and Sedimentology |Fossil Forest Trees |Swanage - Durlston Head - Lower Purbeck Formation & Portland Stone. This diagram shows the distribution of the breccia, the Broken Beds, in the basal Purbeck Formation of Dorset and the relationship of this breccia to the occurrence of evaporite facies. There is a clear relationship although the breccia also extends above the major evaporite horizon. Part of the overlying laminated limestone of Cypris Freestone type is involved in the brecciation. Early or penecontemporaneous crystals of gypsum are very commonly lenticular in form. Later, diagenetic gypsum is rarely so. The early lenticular gypsum is often replaced and present at lutecite pseudomorphs after gypsum, calcite pseudomorphs after gypsum or celestite pseudomorphs after gypsum. This a major part of the common evidence for "Vanished Evaporites". Such pseudomorphs are abundant in the Lower Purbeck Formation of Dorset, but are not normally visible in the field. 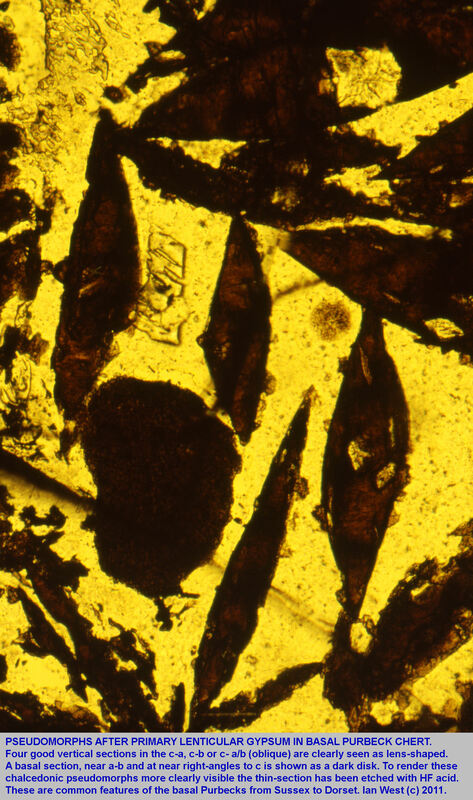 Thin-section petrography is needed. Chalcedony (lutecite) pseudomorphs after gypsum seen on a polished surface of chert from the basal Purbeck Formation, Portesham quarry, Dorset. Such pseudomorphs are abundant in the basal Purbecks at Lulworth Cove, the Fossil Forest, Stair Hole etc. but are not always easily visible without appropriate weathering or special etching of the chert. Pseudomorph after gypsum in fine-grained oolite of the Hard Cap at the Fossil Forest. Calcite pseudomorphs after gypsum in pelsparites of the "Cypris" Freestone Member. 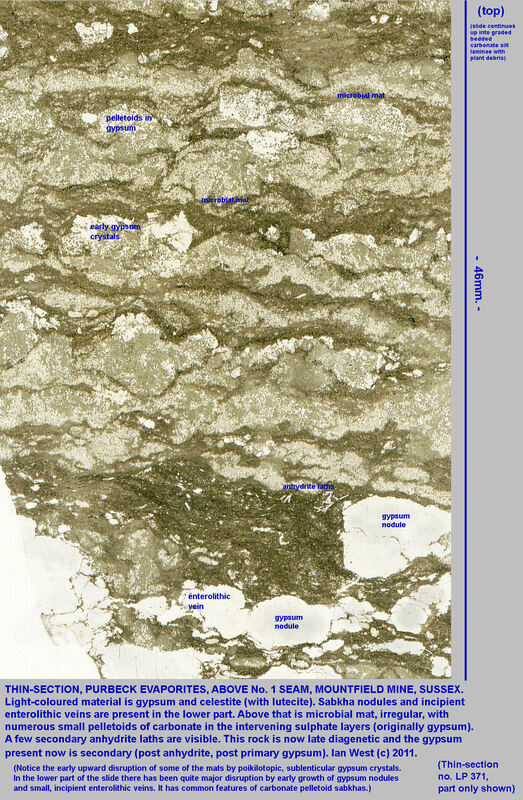 The right-hand section of the lower image is in false colours to give an indication of the original appearance of the gypsum in the creamy-coloured carbonate silt. Please see the papers of West (1964; 1965 and 1979). A summary of the diagenetic scheme as given in West (1979) is reproduced here. More details will be added later. 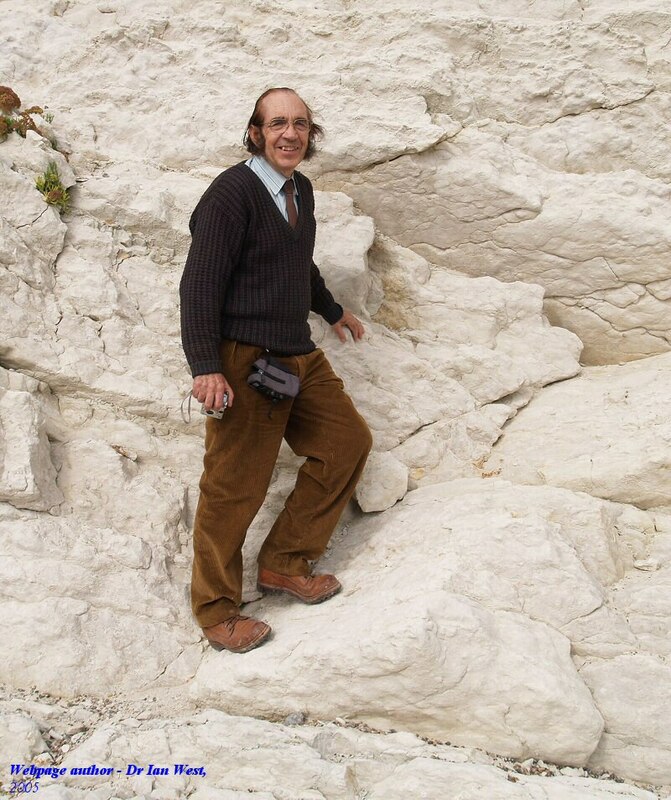 West, I. M. 1979. Review of evaporite diagenesis in the Purbeck Formation of southern England. Symposium on: West European Jurassic Sedimentation - "Sedimentation Jurassique W. European", A.S.F. 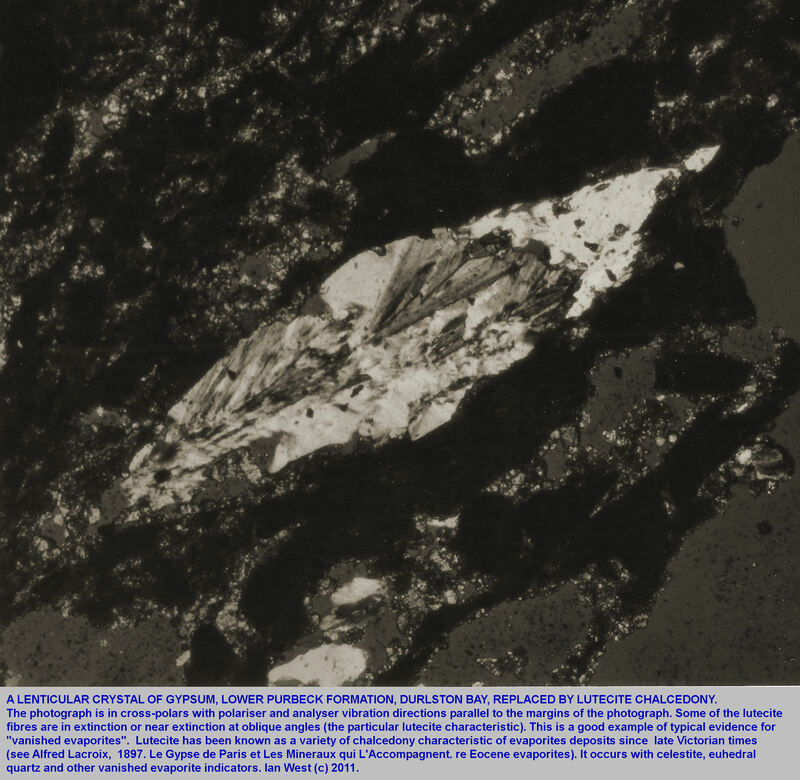 (Association of French Sedimentologists), Special Publication No. 1, March 1979, pp. 407-416. In English with Abstracts in English and French. 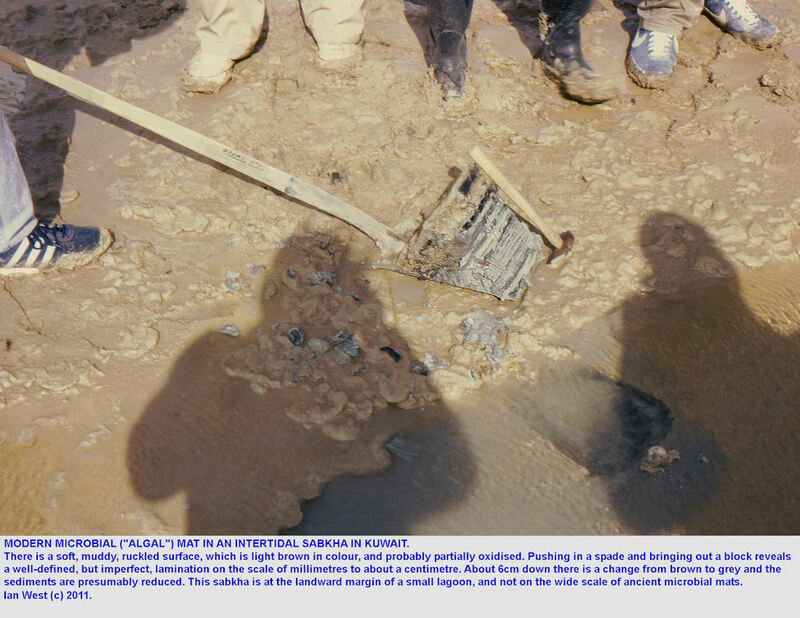 Some criteria for finding evidence of vanished evaporites is reproduced here from West (1979). 1. Pseudomorphs of calcite, chalcedony or quartz (or moulds or casts) after gypsum, after anhydrite or after halite. 3. 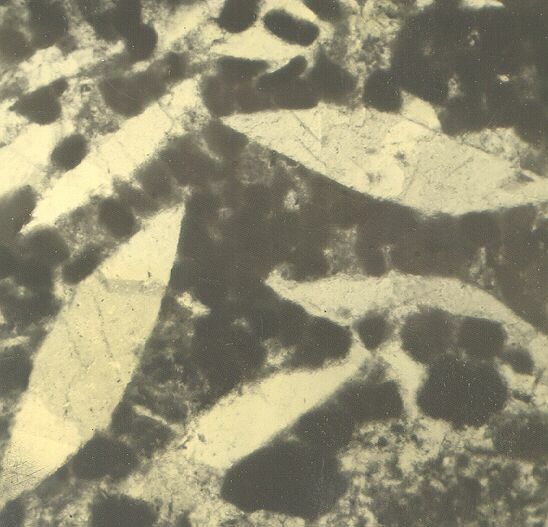 Spherulites of the lutecite variety of chalcedony. 4. Euhedral crystals of authigenic quartz. 5. Celestite, sometimes with calciostrontianite (occasionally barytes or barite). 6. 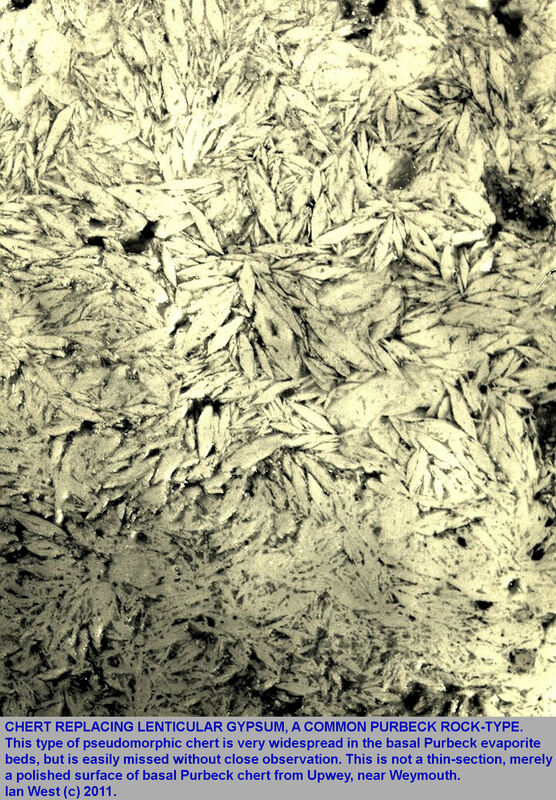 Net-texture, a small-scale relic of gypsum with displaced impurities, now in secondary, sparry limestone, resulting from calcitisation. 7. Chicken-wire, nodular structure or spherical vugs in limestone or dolomite. 8. Coarsely crystalline (sparry) limestone, often porous, and without skeletal debris (possibly calcitised evaporites). May be massive, laminated or contorted. 9. Small contortions that are not obviously of sub-aqueous slumping or other non-evaporitic origin. 10. Minute rectangular relics of anhydrite in quartz or other minerals such as calcite (obvious in quartz because of contrasting moderate birefringence and the rectangular cleavage - but very small). 11. Oligomict limestone breccia with a carbonate matrix (possible calcitised evaporite breccia). 12. (an addition) A crumbly, brown, porous bed of carbonate and clay (like evaporitic cargneule or rauhwacke common in the Trias of the Alps and Pyrenees). West, I.M., Ali, Y.A. and Hilmy, M.E. 1983. 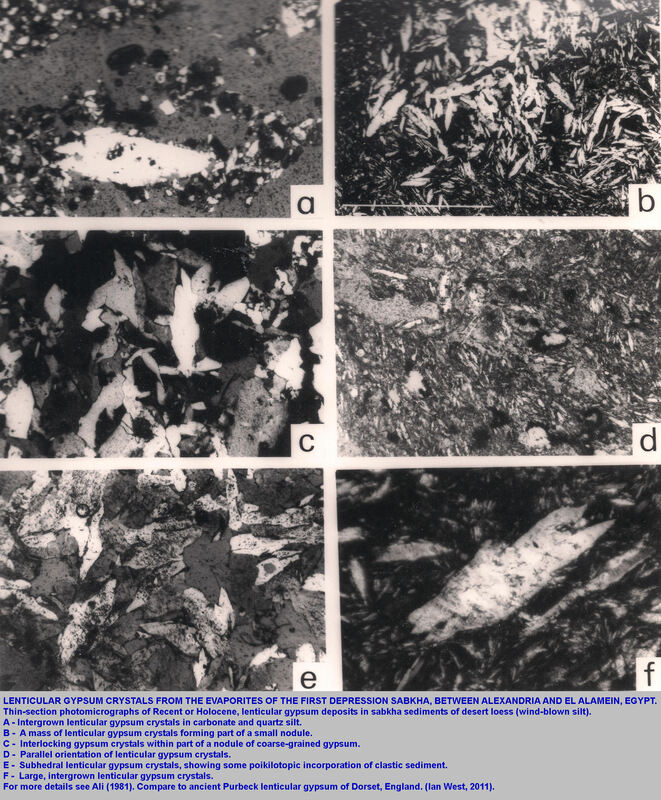 Facies associated with primary gypsum nodules of northern Egyptian sabkhas. Sixth International Symposium on Salt, 1983, vol. 1, Salt Institute, 171-183. Abstract: Modern sabkha and lagoonal, evaporitic environments are well-developed in the Mediterranean coastal zone of Egypt between Alexandria and El Alamein. It is a semi-arid region with an annual rainfall of about 19cm. Landward of the modern, ooid beach ridge is a narrow depression. This is occupied by partially vegetated sabkhas of desert loess and some small lagoons. Those which are moderately hypersaline contain the cockle [common edible, estuarine bivalve], Cardium glaucum; very hypersaline lagoons are precipitating gypsum. The sabkhas are usually underlain by the following sequence of Holocene sediments. At the base are lagoonal shelly silts, locally with Cardium. 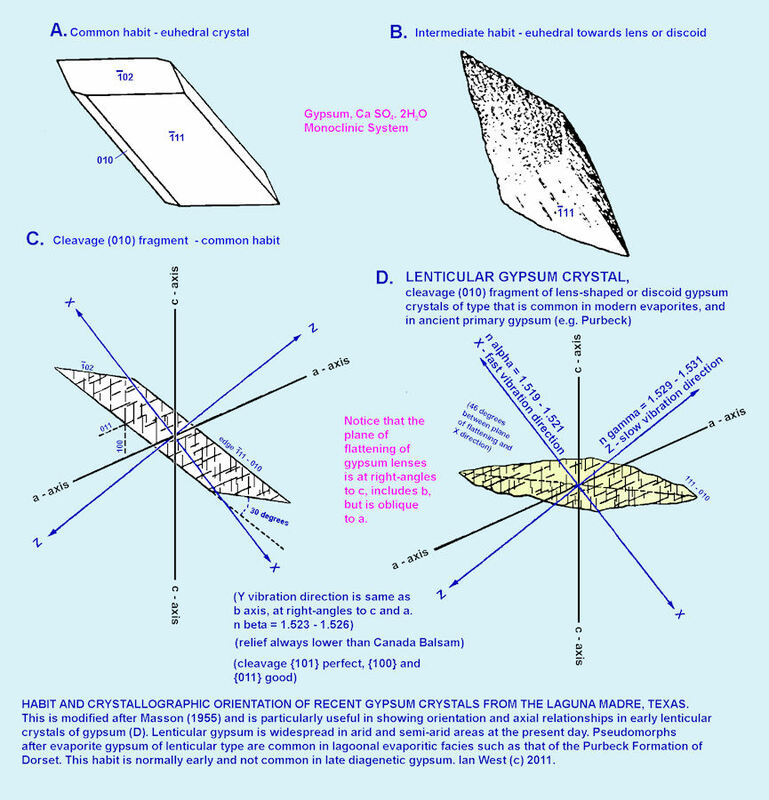 Lagoonal gypsum follows. Then comes desert-loess, within which gypsum nodules are developing by precipitation from capillary water. These sabkha deposits are being gradually covered by ooid sand. 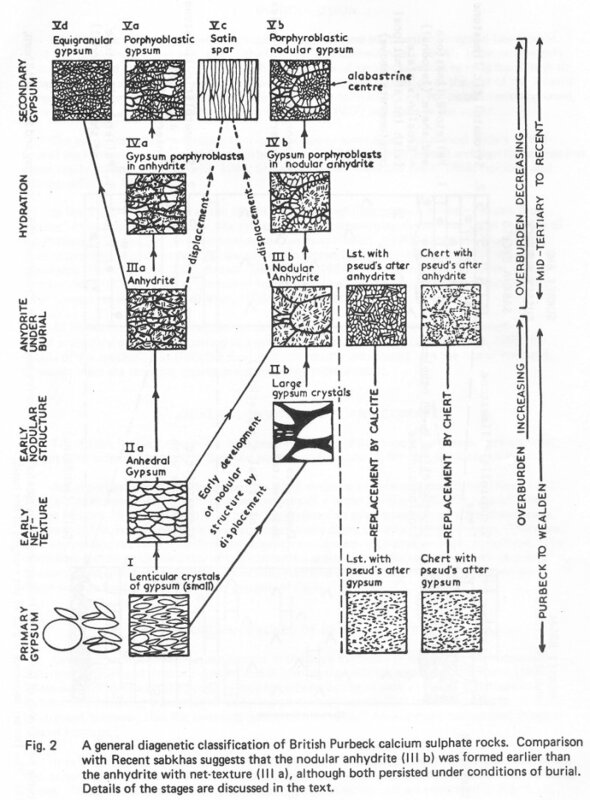 The present marine transgression should ultimately produce a sequence in which an oolitic limestone is overlain by a cockle bed, followed by laminated gypsum, overlain, in turn, by a red bed siltstone with gypsum nodules. This would be capped b oolitic limestone. Ancient strata resembling certain of these facies include cockle beds associated with evaporites in the British late-Jurassic [or early Cretaceous, Purbeck] strata. The facies association of desert loess with gypsum nodules, halite, caliche, palygorskite and scorpions can be matched in the British Trias. End of Abstract. Perhaps the best known examples of ancient "cockle beds" with evaporites are in the lagoonal Lower Purbeck Formation (Upper Jurassic-Lower Cretaceous) of southern England (Arkell, 1947). 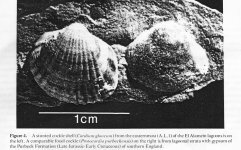 The "cockles" are bivalves of the species Protocardia purbeckensis (Figure. 4). 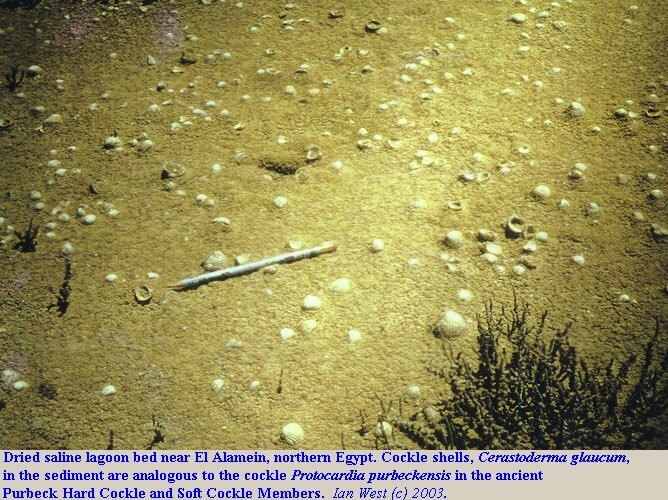 They occur in members known as the "Hard Cockle Beds" and the overlying "Soft Cockle Beds" (Bristow and Forbes in Damon, 1884; Clements, 1969; Ali, 1981). 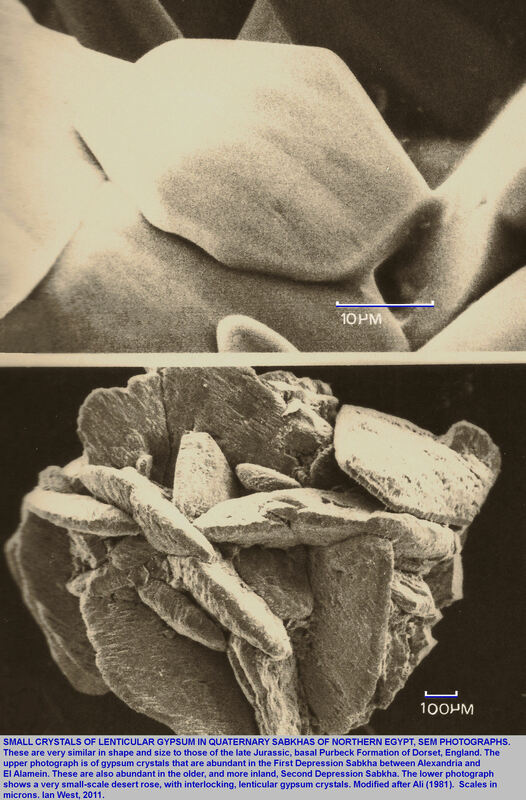 In the Soft Cockle Member there is secondary gypsum that has replaced anhydrite, which in turn is a replacement of primary gypsum (West, 1964). 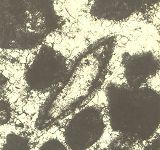 It contains well-developed nodules and enterolithic veins (West, 1965). Calcitized gypsum occurs in the Hard Cockle Member. The usual association of the small cockle Protocardia purbeckensis with evaporites suggests that the species was tolerant of hypersaline conditions. Comparison with modern analogues suggests that it might have been able to live in brine of up to about 60 parts per thousand salinity. 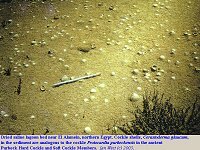 The lack of desert sediments, the presence of coniferous forests and the characters of the insect, molluscan and ostracod faunas is evidence, however, for a climate that was semi-arid and Mediterranean type (West, 1975; 1979; Francis, 1983). This is confirmed by the palaeolatitude of about 37 degrees N. (Smith and Briden, 1977). Go to Bibliography and References on the Purbeck Formation of Dorset. Go to Bibliography and References on Durlston Bay, Purbeck type-section. Go to Bibliography and References on the Isle of Portland. Copyright © 2013, Ian West, Catherine West, Tonya Loades and Joanna Bentley. All rights reserved. This is a purely academic website and images and text may not be copied for publication or for use on other webpages or for any commercial activity. A reasonable number of images and some text may be used for non-commercial academic purposes, including field trip handouts, lectures, student projects, dissertations etc, providing source is acknowledged.